Pirates players are joined by sponsor Hon. Marlon Penn in celebrating their 2015 BVI Softball Association best of seven Championships Series crown. The Pirates beat the Reds 14-7 on Sunday night to win the series 4-2. 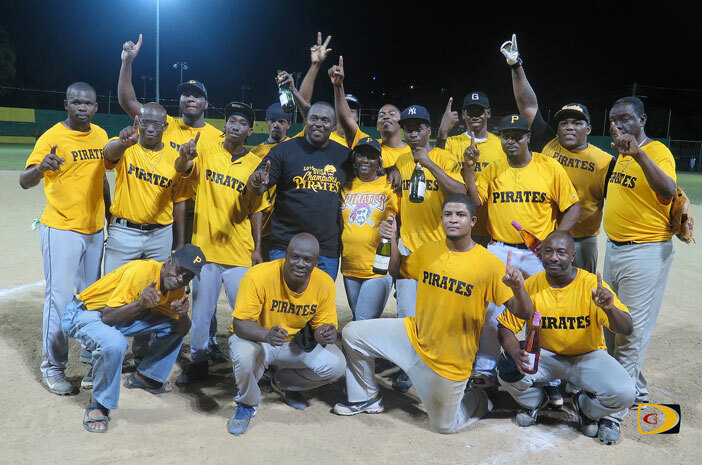 The Pirates took control of the best of seven BVI Softball Association Championship Series that had been tied at 2-2 on Friday night with a 10-1 victory over the Reds, then used the long ball on Sunday, to bomb them 14-7, and secured the title by claiming the series 4-2. The Pirates sent nine men to bat in the first inning as Reds hurler Warren Brooks gave up first inning 3-run homers to Rico Penn and then later to his cousin Nicos Penn, to give them a 6-0 lead. The Reds countered with an explosive five run inning in the second, cutting the deficit to 6-5, triggered by first baseman Jerry Gooding’s 2-run double. Brooks walked the bases loaded in the third and with two outs, Devon Bedford drove in three runs on a double to center, bulging the Pirates’ lead to 8-5. In the bottom of the inning, Gooding tripled with two outs for his second extra base hit, then came home on Akeem Francis’ double to make it 8-6. Brooks, who had control problems, worked the bases loaded in the fourth and was relieved by 65-year old Roy Hill, the league’s oldest player in his 50th season with two outs. Nicos Penn connected for a 3-run double off Hill to give the Pirates an 11-6 advantage. The Reds came up with a run in the fifth, but Tramore Fraser lined a 3-run homer to left field for his fifth run batted in on the night, giving the Pirates a 14-7 victory and the title. Smith said the Reds are a great team with good batting, good fielding and have good camaraderie and they stick together, but lack one thing—a good pitcher.